About John E. Message John E.
A land shaped by water and time. John was first class. He was a gentleman as well as a geologist and historian and he made the day of South Dakota touring quite a treat. He was willing to take our tour in any direction, depending on our likes and dislikes. It is a shame there are only 5 stars as he deserves 10. Thank you John ! TOUR GUIDE RESPONSE: Michael, Thanks for the wonderful and clever review. It is a shame that there are only 5 stars available. Travel well, John E.
John is a fountain of info. He made the tour very enjoyable because I learned so much. He understood what we were interested in and focused on that, and did not try to fill the day with irrelevant fodder. My wife is not a US citizen, but she was intrigued about how interesting John made the day. Totally accommodating to our pace and timing. Do yourself a favor and use a private tour to see Crazy Horse and Rushmore. No need to get involved in the inconvenience of a group tour. TOUR GUIDE RESPONSE: Michael, It was a pleasure spending the day with the two of you and I am glad that I helped to make it a great experience. travel wisely and have fun, John E.
The day was amazing. Never thought SD was so beautiful. The Rapid City area has so much to see. John spent all day with us and was so knowledgeable. He was an excellent driver and extremely informative. You will not be disappointed. TOUR GUIDE RESPONSE: James, Thank you for allowing me to share our area with you and the family. I enjoy spending time with folks who enjoy the sights and the stories of our area. John E.
Excellent experience. Only problem is probably too much to see and need to decide what you want to see. Having said that John provided a highly enjoyable and educational experience. Definitely recommend. TOUR GUIDE RESPONSE: Richard, I have read all 3 of the reviews and I am condensing the responses into one. thank you for spending time with me and allowing me to share our area with you and Richard. 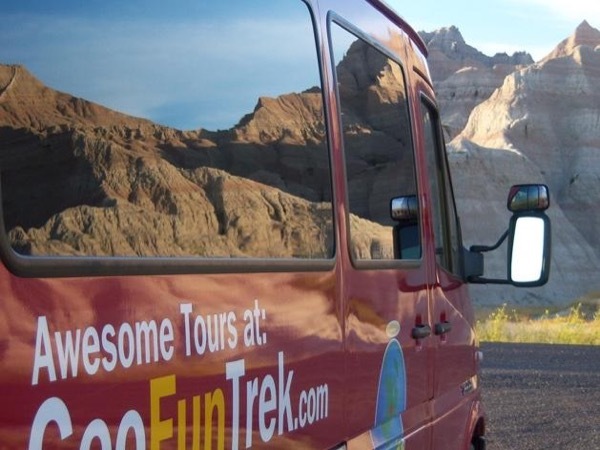 Thank you, John E.
Extensive local knowledge made this an excellent way to see the Badlands. Best seen as sun sets and plenty stops at points of interest and beauty. Nice touch with water and snacks. Extremely enjoyable tour with a highly experienced and knowledgeable guide. John went out of his way to ensure we saw what we wanted and were looked after. Plenty of stops for photos and points of interest. John is wonderful. He showed us areas we would have never found on our own. He is witty and a poet. We had a group of 13 and not one person asked a question he could not answer. He was with us for 9 hours and there was never a dull moment. His knowledge of Mount Rushmore and the Custer park is amazing. Thank you, John, for a wonderful day. John was an excellent tour guide. He is very knowledgeable about the area and much of the history involved. We felt very comfortable in his automobile and thoroughly enjoyed ourselves. My husband used a wheel chair at times and John was so helpful in pushing him around. I would definitely recommend John to anyone I Know that would be traveling in that area. Kudos to him for sure! TOUR GUIDE RESPONSE: Linda, Thank you for the nice review. It is always a pleasure to help guests and share our wonderful area with them. Thank you, John E.
John is a marvelous, knowledgable guide. We learned so much about the history of the area, the geography, customs of the native and present local people, etc. My wife and I were escorted by him as if he were long-time friends. We would strongly recommend John to anyone that wants to learn, be personally escorted and not tied to a bus and its timing. TOUR GUIDE RESPONSE: Steve, Thank you, it is a pleasure to share a day with enthusiastic and fun folks like yourselves. John E.
We had such a wonderful day of discovery with John as our guide. His pleasant personality along with the incredible wealth of interesting information he shared made for a truly enjoyable and memorable experience. TOUR GUIDE RESPONSE: Alice, Thanks for the review and staying in touch. Take care and travel wisely. John E.
John did an outstanding job. He knew the area, the individual sites and all the necessary information need to make it an enjoyable trip. TOUR GUIDE RESPONSE: Ali, It was a pleasure to share our area with both of you. A receptive and interested couple, with a lifetime of stories to share such as yourselves, make for a fun and informative day. Travel safely and continue to enjoy all of life's pleasures. Thank you, John. John has a wealth of knowledge of the area and makes it easier to understand the geology of the area. A fascinating trip. TOUR GUIDE RESPONSE: Sharol, Thanks for coming to the Black Hills and taking a tour with me. John E.
John is an excellent guide, informative and attentive to our interests. He is a good driver and surprisingly a good reciter of poetry. Very fun and informative. TOUR GUIDE RESPONSE: Sharol, I am glad you "got it" and enjoyed the time we spent together. John E.
One of the best tours I have ever taken. John was a wonderful guide. He was knowledgeable, friendly, and didn't mind our endless questions. He was well prepared and very flexible. We had a big age spread in our group and everyone was entertained. You can't go wrong with this tour. John is an excellent guide, he is extremely knowledgeable about the area, smart, funny and very accommodating to your needs. TOUR GUIDE RESPONSE: Valerie, Saw that other response and appreciate the time we spent together. John E.
TOUR GUIDE RESPONSE: Valerie, I am glad to be allowed to share such special places with you & your family. John E.
John was very accommodating to my needs. He was very knowledgeable and understanding. This was a great tour and I enjoyed myself very much. Thanks John for a wonderful day. John was knowledgeable of the history, geography, geology, culture -- everything we could hope to learn and more. He was patient with 4 seniors and worked everything around so that we could see the most and walk to the most with our restricted abilities. This all-day tour was the best of our two week trip and I do not hesitate in recommending John!!! John was a wonderful guide; knowledgeable, patient, and kind. We had a wonderful experience. The guide made the trip very memorable. We spent a whole day with John. The guy is knowledgeable big time. Friendly too. John was extremely knowledgeable, extremely courteous & catered to our needs. He was right on time to get the tour started. We went over the whole day ahead of time & he encouraged us to let him know if we wanted to make any changes. We arrived in Rapid City on 9/11/14 & received 7 inches of snow(earliest snow on record in 100 years). When John picked us up Friday 9/12, he turned the snowfall into a positive experience. The snow on the trees & the mountainside gave us a beautiful backdrop to our drive.